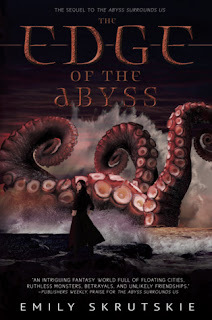 It’s been almost a year and a half since I read The Abyss Surrounds Us, but within a few pages of The Edge of the Abyss, I was sucked back into Cas’s world of pirates and sea monsters. This was a fantastic conclusion to a well-written, action-packed sci-fi adventure in a world that’s easy to imagine. Picking up shortly after where the first book ended, Cas has left her life as a Reckoner trainer and sworn allegiance to the totally badass pirate queen, Santa Elena. As one of Santa Elena’s chosen few, she’s in training to one day take over as captain of the Minnow. Her one advantage is an extensive knowledge of Reckoners, which puts her at the forefront when the crew discover the rogue Reckoners that are swimming free in the NeoPacific and could cause irreparable damage in many ways. I loved how The Edge of the Abyss built on The Abyss Surrounds Us. In this book, we get to see more of the pirates themselves and learn about pirate politics, which was fascinating. We get to see more growth from Cas, and we also get to see more of the secondary characters, which I liked. They became real people for me in this book, a true supporting cast. I have slightly mixed feelings about the romance in this one. On the one hand, I understand Cas’s hurt and anger and being unsure whether she can forgive Swift for the things that came to light at the end of the first book. She and Swift are finally on equal footing, but so much has happened that seems impossible to get past. Their relationship was always complex, and I appreciated the slow burn of it, but there was almost too much back and forth. Cas has a lot to deal with besides her feelings for Swift - guilt over leaving her life and family behind, uncertainty over her future, trying to figure out a plan to deal with the Reckoners - so while I would have easily understood the romance not being a main focus of the plot, the way it was handled makes the plot feel choppy at times. That being said, the emotions were realistic. Their romance was never hearts and rainbows, full of mushy sentiments and pledges of eternal love, and that made it more realistic than a lot of other YA romances because young love is often rocky and uncertain and confusing. I was ultimately satisfied and I appreciated how things ended, but the rocky ride was a bit tiresome at times. 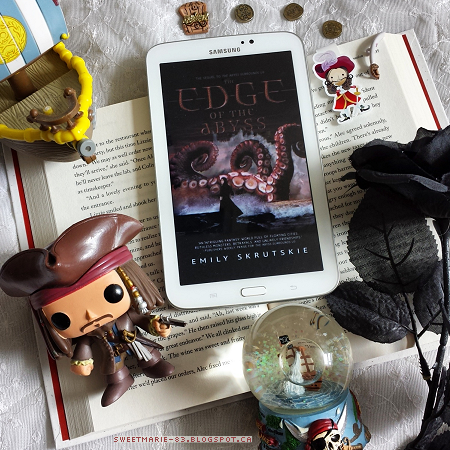 The Edge of the Abyss is fast paced, engaging, and full of thrilling action and great characters. I’d love to see this duology turned into a movie or TV series. Have you read The Abyss Surrounds Us or The Edge of the Abyss? What did you think? If you haven't read them, do you plan to? Do you have any recommendations for books featuring pirates?